Dixie Reading from Her Book: Emotional Business – None of Mine! I’ve mentioned my new book, right? Har! Yeah. Well, here’s a chapter I read on video for y’all on the Ace of Cups. Hope you like it! Be sure and check out Amazon if you’re interested in buying it. They seem to be shifting around the discount. I have no control over that, but maybe you’ll get a deal! My book! My book! My book! You can buy the book online at Amazon, Createspace, eventually Barnes & Noble online and God knows where else. I’ve had some asking about signed copies. Hilarious, ain’t it? Makes me feel all famous or something. So I got a few for signing; you have my full permission to eBay off these puppies immediately once I become super-famous and appear on Oprah! Update: I’ve sold the copies that I ordered for signing. If you’d still like a signed copy, you can contact me to get on a waiting list and I will do another round if there is sufficient interest. But otherwise, just get a copy from Amazon! UPDATE: Both this e-book and the first volume, “Living the Major Arcana,” have been combined into one volume. Available in either paperback version or Kindle version. Woot! Glad Mercury’s back to behaving! Y’all remember a while back, when I announced my book, ]Everyday Tarot Archives: LIVING the Major Arcana on Amazon? I pulled the best of my Daily Tarot archives on the Major Arcana and put them together in a single, card-order volume. Well, I said then I was doing a second volume, to cover the rest of the cards. Good thing I committed, because putting it together was a boatload of work. Ack! But it’s finally done. And I am happy to say, I think it came out even better than the first one. So, you can get Everyday Tarot Archives: LIVING the Minor Arcana now for $5.99. Currently, it’s available exclusively on Amazon in electronic format. Amazon Prime members can read the book for FREE. Even if you don’t own a Kindle, you can still read on one of the many free Kindle reading apps (for smartphones, tablets, PCs, Macs or online). For those who’ve asked, I’m sorry, but I cannot currently offer it for sale through this site or another bookseller, per my agreement with Amazon. And for my geeky foks–er, excuse me, “Geminis”–all my books are DRM-free. That means once purchased, it may be read on any device or converted to any format you prefer. Find out more about DRM here. Still no hard copy available yet. One thing at a time, already! But thank you so much for your support and I hope you all enjoy it. P.S. I’m celebrating with a gift . A Gift for you. But just for a minute. In celebration of my next edition of EVERYDAY TAROT ARCHIVES being released like, any second now(! ), I’m offering a free download of the first edition, LIVING the Major Arcana! But you better be quick. Please feel free to pass this along to anyone you think would enjoy it. 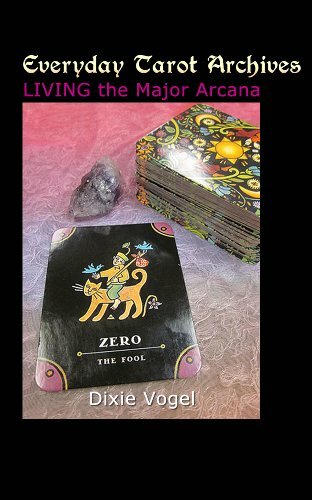 Now on Amazon – Everyday Tarot Archives: Living the Major Arcana! UPDATE: Both this e-book and the second volume, “Living the Minor Arcana,” have been combined into one volume. I’ve been wanting to pull together some of my best Tarot writing for a long time now. As recently noted, I’d done quite a lot of work over the last few years. But reviewing, editing, and (God help me!) formatting it all is no trivial task. Therefore, it’s with the pride of accomplishment I introduce Everyday Tarot Archives: LIVING the Major Arcana! It went live yesterday just in time for Summer Solstice. Fitting, don’t you think? To y’all who have told me you like to go back and reference columns on specific cards, this should help. This volume only covers the Major Arcana, but I will be releasing additional volumes that cover the pips as well; we’ll be hitting every card in the deck at least once. I may release a paperback version eventually, but it won’t be available before the entire series is done so it be a single volume. For less than the cost of a latte (i.e. $4.99), you can own Everyday Tarot Archives: LIVING the Major Arcana. Currently, it’s available exclusively on Amazon in electronic format. Amazon Prime members can borrow the book for free. Even if you don’t own a Kindle, you can still read on one of the many free Kindle reading apps (for smartphones, tablets, PCs, Macs or online). And if you do borrow or order this book, I would VERY MUCH appreciate it if you would take the time to post an honest review on Amazon. I’m not looking for 5-star reviews so much as I’m hoping for good feedback to help people make an informed choice about purchasing the book. I know what I do is not for everyone, and I want the people who buy the book to be happy with their purchase. Thanks for your support and any help you can offer spreading the word. I saw somebody mention in a discussion recently how their crystals and gemstones love to disappear and reappear. I can’t tell you how relieved I was to hear somebody else say that! Mine do so with alarming regularity. And it’s not just me being absentminded! Sometimes, these things show up in places that I’ve looked dozens of times, or disappear right out from under my nose. I can get wrapped up in my own little reality, but I’m not that bad. I’ve been telling myself they do this when I am over-using a particular stone or would just be better suited for another stone’s energy. When I need it, I’m certain it will appear on my radar. In other words, I simply personify the stone and say it’s the stone’s preference. Flipped open my copy of Ask Your Guides: Connecting to Your Divine Support System and noticed that section I opened to was talking about little tricks various guides play–like hiding things to get your attention. So it’s not my imagination! Maybe it’s the guides doing the hiding. Or the crystals themselves are the physical manifestations of guides’ energy. I don’t know! I just know the little suckers hide from me. Do your gemstones play hide and seek?